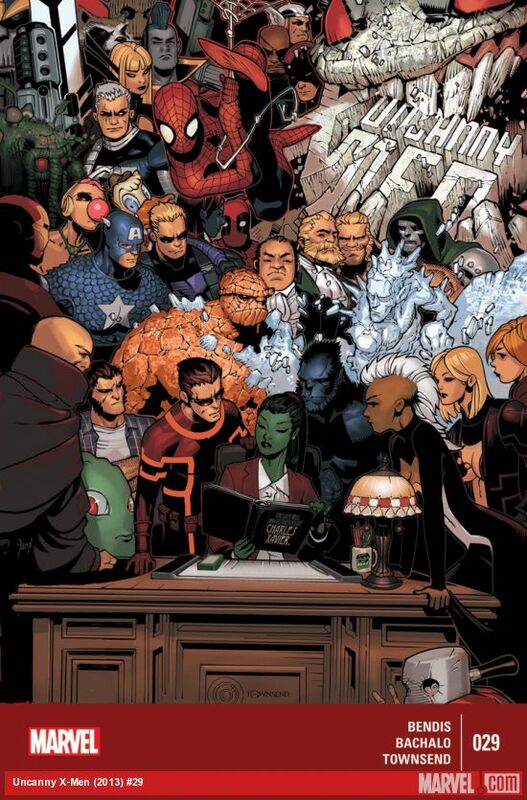 The opening of a large scale event, with many Marvel Universe characters. Artwork of an immensely powerful villain, against a grim background. Insight into Tony Stark’s character. Hatred themes – how the emotion is used, and reactions to it. Large scale events bring the disparate fragments, individuals, and teams from the Marvel universe. Medusa, Invisible Woman, the X-men, Two teams of Avengers, the Vision, Captain America. There are a vast selection of bright colours from the many costumes worn by Marvel’s Super heroes. They charge into battle – a thunderstorm rages over the rustic wood huts constructed to hold mutant prisoners. A grim scene. Even during brighter scnenes, a gloomy haze seems to cover sources of light. These Avengers, X-men, and individual heroes unite against a giant, red, horned colossus calling itself “The Red Onslaught”. Imperial purple and scarlet armor plates; black keratinous horns curved inward; black octopus tentacles sprouting from its back. This entity is more creature than human. It’s a giant, at least the height of small office building, and was created when the Red Skull attempted to fight Magneto, and was killed by the magnetic villain. Red Onslaught tortures and torments. With telepathy, it forces everyone around the globe to think hateful and violent thoughts. Not simply unleashing repressed anger, envy, or other vicious thoughts bubbling below the surface, Red Onslaught has telepathic power enough to inserting hate into those without any. Conflict is manufactured: a real nightmare. The first target: Tony Stark. Iron man once had the weaknesses of all the Avengers, X-men, and other Marvel Universe individuals saved in a register of super heroes – his initiative files. These were thought lost – his memories deleted like data on a corrupt hard drive. No malicious thoughts are buried too deep for Red Onslaught. Stark’s anguish is clear when he comes to understand that he has been subtly influenced by the Red Skull for some time now. Through the powers of Wanda Maximoff, and the setting, the comic references the historical use of hatred and propaganda in World War Two. Onslaught argues Iron Man’s anxiety comes from a hateful place. 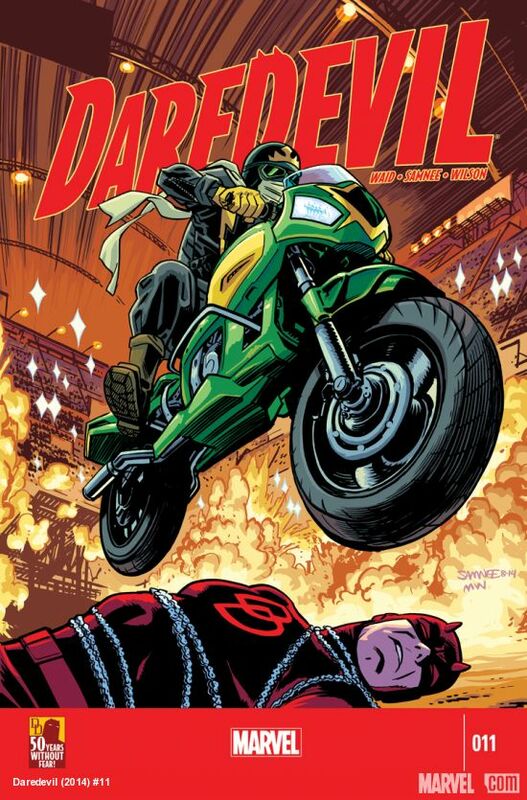 Hatred is the theme of this comic book – while it is the first in a large scale event, the opening issue makes a strong impression with this theme. What people do with hatred, and what hatred causes play out in this issue. Historically, hatred’s role in World War two is highlighted: a concentration camp setting appears, referencing the Nazi party, and the propaganda that created hate. The Red Skull is a historical villain, and the roots of the character in World War two are clear in the concentration camp setting. Further, scenes where Scarlet Witch is coerced into manipulating reality into a “nazi nightmare” show more historical references. It’s nothing close to the House of M story line, but stands out as a significant moment nonetheless. Red Onslaughts breaks down Iron Man’s fears and anxiety, mocking Stark. Iron Man’s catalog of weaknesses was compiled from Stark’s hatred of his friends, not fear or anxiety, according to the creature. 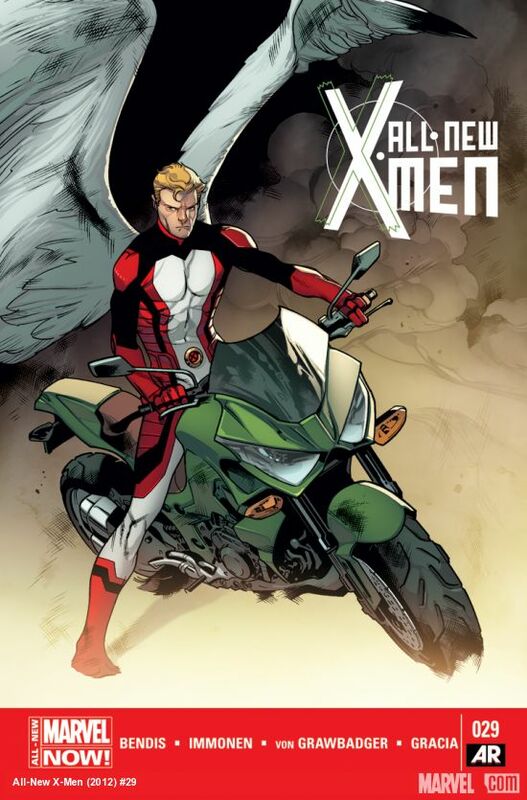 Avengers and X-men: Axis #1 is published by Marvel Comics. Rick Remender (W.) Adam Kubert (A.) Laura Martin and Matt Milla (C.) Chris Eliopoulos (L.) Cover artwork by Cheung and Ponsor. Force, movement, and lines of action are clearly visible from scenes with X-23, who slashes through the air. Bright purple and red colour dominate this comic. One pivotal strike from X-23 shows off a powerful, downward line of action. Xavier can’t stand up to her assault. She cuts through the air with claws that leave trails. It’s easy to follow the action from panel to panel with these movements. Psychic power explodes throughout this comic book. Xavier Jr.’s power is light blue, and icy. Jean Grey, in full flight, unleashes purple light. Pages of this comic are filled with it. When the light is not purple, it’s dark shades of red. This colour represents anger. In this case, It’s X-23’s rage. She was attacked and left in the snow. She’s angry. Raze, like Xavier, catches up with her in these scenes. Emma Frost receives some development, while Cyclops leads the team, taking charge of the X-men’s ethical decisions. Deadpool also has some good moments. Emma Frost has a scene with excellent dialogue. She talks to Jean Grey about the events of Battle of the Atom, specifically, about Xorn, and what happens to Grey if she continues to live her life in the present, never returning to the moment in the past she and the other X-men left. Deadpool has a few hilarious moments. Iceman is less animated than he has been in previous issues. Scott Summers also has a moment of good dialogue, and lays down a value for the X-men to follow. Cyclops leads the team, which impresses, considering his character has been running since the events of Avengers Vs X-Men. A moment towards the end of the issue references Avengers Vs X-Men. Summers recollects his actions under the power of the phoenix force. The comic brings an interesting value discussion to light. It draws a line between good and evil – the X-men, and the Brotherhood – The X-men consistently state that there are lines they will not cross, which separate them from their enemies. When the psychic Stepford cuckoos confront Xavier alongside Jean Grey, they comment that Xavier is a reminder of what happens when they “let themselves slip”. Abuse of their talents leads to becoming like Xavier. Later, Molly Hayes tries to attack a defeated Raze. Beast tells her “Don’t be them”. Later, when facing the wounded Xavier, Scott Summers states “Today, your lesson is to be better than your enemies”. When faced with a defeated Brotherhood, the X-men will not respond using their enemies methods. The comic has that value: a distinction between good and evil. 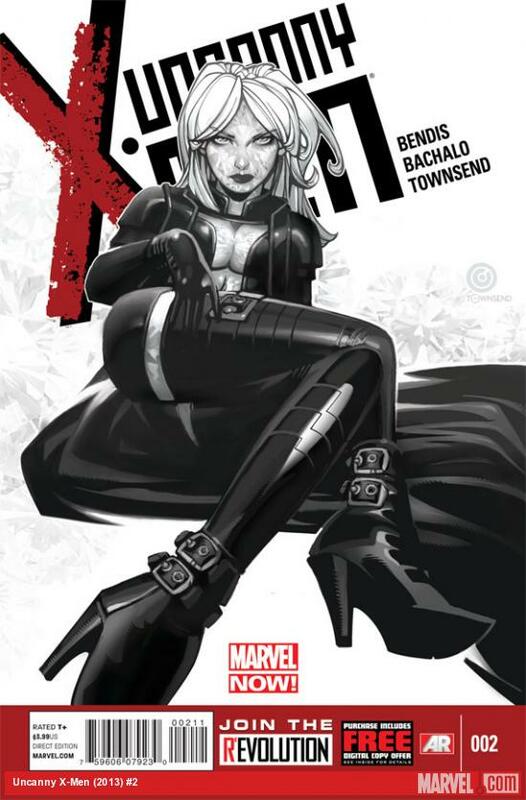 All New X-men #29 is published by Marvel Comics. ($3.99 USD). Brian Michael Bendis (W.) Stuart Immonen (A.) Wade Von Grawbadger (I.) Marte Gracia with Jason Keith (C.) VC’s Cory Petit (L.) Cover Artwork by Immonen, Grawbadger, and Gracia. Time travel in popular culture can be like playing a dangerous Jenga game. Pull out too many bricks from the foundation – the past – and the future might collapse. 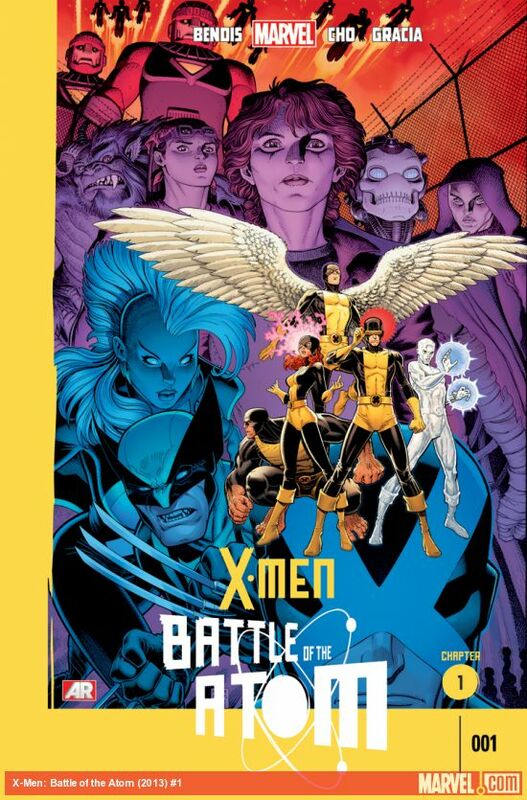 In the latest X-men crossover comic book from Marvel, Battle of the Atom, the consequences of the X-men‘s experiments with time are close to catching up with them. Maybe Beast bringing his past self, along with younger Jean, Cyclops, Iceman, and Angel, to the present was not a great idea.